A TEENAGE thug launched a horror bottle attack on his vulnerable girlfriend - after he had downed a whole bottle of Buckfast. The 17-year-old boy repeatedly smashed the empty bottle over the head of the girl leaving her covered in blood and with serious injuries. The 16-year-old girl fell to ground during the sustained assault where the boy continued the drunken attack by punching and kicking her to the head. The vicious incident saw the girl rushed to hospital where she received treatment for deep lacerations to her head and face as well as a broken nose. Witnesses heard the terrified girl’s screams for help and rushed from their homes in a bid to stop the attack in the city’s Gracemount area in May. The 17-year-old youth, who cannot be named due to legal reasons, appeared at Edinburgh Sheriff Court today where he pleaded guilty to the attack on his former partner. Sheriff Robert Weir QC deferred full sentence to next month. Procurator Fiscal Rachel Aedy told the court the girl, who also cannot be identified, suffers from a learning disability called Global Development Order and the young couple met while on a course at the capital’s Stevenson College. Ms Aedy said: “The girl travelled to Gracemount to meet the accused and she noted he was in possession of an almost empty bottle of Buckfast. He admitted he had consumed the contents along with a quantity of cider. “Around 11pm they were walking to a bus stop when the accused handed the now empty bottle to the girl and asked her to throw it away. She refused to do this and handed the bottle back to him. “At this point and without warning he began to repeatedly strike her on the head and face with the empty bottle of Buckfast. The fiscal said witnesses at nearby homes heard the girl’s frantic screams and when they looked out saw the boy laying into what they thought was “an animal lying on the ground”. 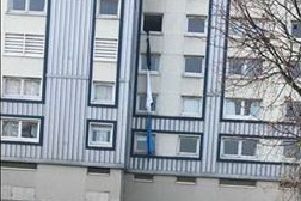 The attack was halted and the blood-covered victim was taken to a nearby house before being rushed to Edinburgh Royal Infirmary. Her injuries included severe lacerations to her head and face which required stitches, while she also suffered a broken nose and swelling to her face. The boy was picked up by police a few hours later and during a subsequent interview he told officers he “could not remember doing any of that”. Officers discovered his clothes and shoes were covered in the girl’s blood when they searched his home in the city’s Buckstone area. Solicitor Neil Martin, defending, said his young client “appreciates the severity of this matter” but said he would reserve his full mitigation to the sentencing diet. Sheriff Robert Weir QC deferred full sentence to next month for social work reports and a restriction of liberty assessment to be carried out. The 17-year-old boy admitted to assaulting a 16-year-old girl by repeatedly striking her on the head and face with a glass bottle and repeatedly punching and kicking her on the head as she lay on the ground at Balmwell Grove, Edinburgh, on May 26 this year.